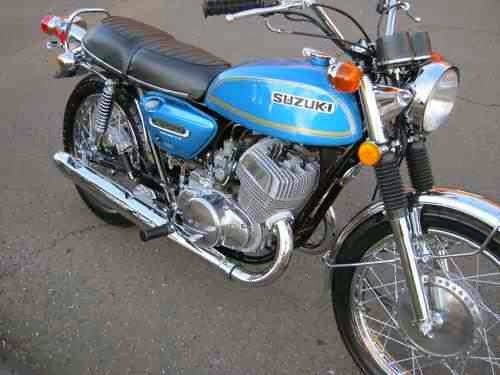 Suzuki's T500 twin was by no means the most stylish or sophisticated bike of the late 1960s and early '70s, but in terms of providing speed at a cheap price it was outstanding. British twins were generally more expensive and less reliable: the Japanese multis that arrived in the 1970s cost far more. For two-wheeled thrills on a low budget, arguably the only bikes to touch the T500, which was known as the Titan in the States and the Cobra in the UK, were Yamaha's rival 350cc two-strokes. On its introduction in 1967 the T500 was essentially a larger version of the T20 Super Six two-stroke twin that had shaken up the 250cc market a year earlier. The heavily finned, 492cc air- cooled motor was the centrepiece of a simply styled, reasonably good-looking roadster. The first models had twin 34mm carbs, but after 1969 the Suzuki used 32mm Mikunis, producing a claimed maximum of 44bhp at 6000rpm. 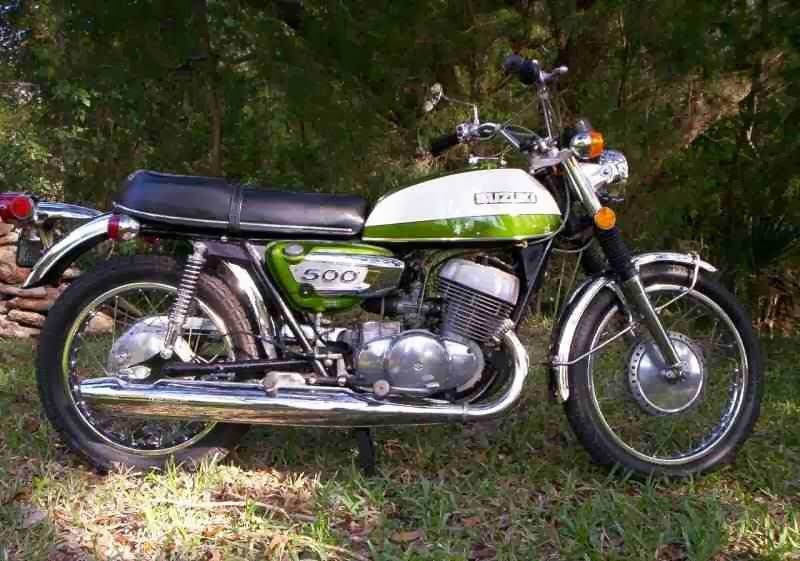 The motor's tuning potential was proved by Suzuki's TR500 twin racebikes. on which riders including Ron Grant and Art Baumann won many races and were timed at over 150mph (241km/h). For a two-stroke the T500 was reasonably torquey, the motor feeling flat at very low revs but pulling fairly crisply from 3000rpm. Above 4000rpm it took off, the note from the twin pipes rising to a high-pitched snarl as the tacho needle span faster towards the 7000rpm redline through the five-speed box. True top speed was between lOO mph (161km/h) and a 1IOmph (I77km/h). The earlier models were generally slightly faster due to less restrictive exhausts. The T500's chassis was less impressive. Its twin- downtube frame and swingarm were made from steel tubing of distinctly narrow diameter. Its 35mm diameter front forks had external springs under their gaiters. Like the twin rear shocks, they were ineffective devices that contemporary tests showed to be over-sprung and lacking in damping. Much of the time the Suzuki 500 nevertheless handled reasonably well, thanks to its combination of 19-inch front wheel, conservative steering geometry and a friction steering damper at the steering head. At a more aggressive pace, though, the twin could quickly get out of shape. Many owners replaced the original rear shocks with superior aftermarket units, such as Girlings, but even that modification could not make the T500 handle particularly well. Nor did its front and rear drum brakes provide much in the way of stopping power, though this could be improved with the use of aftermarket brake shoes. Despite the T500's mediocre handling and braking, Suzuki introduced very few changes during the model's long life - partly because its competitive price ensured that it carried on selling quite well, particularly in America. But they did eventually uprate the front brake. In 1976 the twin was given a single front disc, a bigger fuel tank, electronic ignition and a handful of other detail changes. It was also renamed the GT500A, in an attempt to bring it into the GT range of triples that Suzuki by then built in 380, 550 and 750cc sizes.